How can centimeter cubes help us measure volume? In the last session, students had a fairly easy time putting objects in volume order because the objects were dissimilar in size. In this session, the exercise becomes more difficult. Can students use centimeter cubes to measure the volumes of 4 blocks? Challenged to order four wood blocks of different shape but similar volume, students struggle to “guesstimate.” As it becomes clear that they need a standard unit of measure, students are given centimeter cubes to work with. By constructing replicas of the blocks with the cubes, they are able to check their estimates and put the blocks in proper volume order. Prepare and post a class table labeled “How We Measure Things”; an example is given in Step 1. Prepare and post a class table labeled “Order of Blocks by Volume”; an example is given in Step 2. 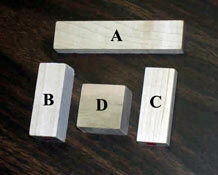 Label sets of 4 wooden blocks A, B, C, D; see image in Step 1. Look for evidence that they can distinguish volume from other measurements as students use centimeter cubes to find the volumes of 4 blocks. Third grade students often confuse volume with area or height. 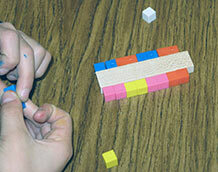 Do students take all 3 dimensions into account as they estimate the order of the blocks by volume? When they check their estimates, do they line up the cubes along one edge? Surround the block? Measure the height? Build a 3–D copy or replica? To provide more experience with a difficult concept — volume is hard — a next step might be to pair students and ask them to explain their measurement strategies to each other. How could we actually measure the amount of space these objects take up? How can we measure their volume? Have students brainstorm some answers. They may suggest measuring the height, or the weight, or filling the objects with water and then measuring the water in a measuring cup. Some of their ideas will be on the right track; others will not. As they grapple with the question, listen to what they say. Are they confusing weight and volume? Are they thinking three-dimensionally? How much space (VOLUME) ??? When we want to measure the height of something, what units do we use? What about weight? Distance? Temperature? Then fill in the last line of the table: “How much space (VOLUME),” leaving question marks in the units column. Let students know that by the end of the class, they will have an answer. But first they have a new challenge. Volume formulas: Some students may know a formula for calculating volume. Acknowledge any algorithms that are offered, but let everyone know that the class will use a different method for measuring volume. 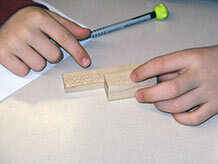 Show students the four wooden blocks, and tell them their task is to put them in volume order. Emphasize that they must work together, that they will have to investigate the blocks very carefully, and that they must come to agreement before recording the order in their notebooks. Explore and Estimate: Give students about 5 minutes to explore the blocks and to range them on a volume line from “Least volume” to “Most volume.” They will quickly discover that this exercise is harder than the last one, for the volumes of the blocks are very similar. As you circulate among the groups, ask how they are making their decisions and encourage students to think about how they might actually measure the volumes. As each group comes to consensus, have a volunteer record the order in the class table. Students should also record their order in their notebooks. When the table is complete, ask the class to study it. Do they see any patterns? Does everyone agree which cube has the greatest volume? The least volume? Did the groups use different strategies? Where are there differences of opinion? Acknowledge that the task is hard, and let students know that it’s OK to disagree because these are “guesstimates,” not measurements. Similar volumes: The volumes of three of the blocks are intentionally similar (or the same). As in Investigating Weight Investigation 1 (when the students tried to distinguish similar weights using only their senses), the point is to establish the value of having a measuring system that is precise and controlled. Does anyone have any more ideas about how we might measure volume? * The data for “Measured Order” will be filled in during Step 4. The volume order of the cubes from least to most is C, A, D, B or C, D, A, B. The volume of Block C is 10 cubic centimeters. The volume of Blocks A and D is 18 cubic centimeters. The volume of Block B is 20 cubic centimeters. While students are still in their small groups, distribute enough centimeter cubes so that each student can hold several. Do you think we could use these tiny cubes to help us measure volume? How could they help use figure out the correct order of the block? This is a small cube; in fact, every edge of this cube is just 1 centimeter long. The cube takes up only a small amount of space. That amount of space is called 1 cubic centimeter, and that’s the unit of measurement that scientists use to measure volume. Write “cubic centimeters” in the empty cell of the “How We Measure Things” table. Explain that two of these cubes take up 2 cubic centimeters of space (or “have a volume of 2 cubic centimeters”) and five cubes have a volume of 5 cubic centimeters, and so on. Can you think of anything that takes up about 1 cubic centimeter of space? Where would one of these cubes go on our volume line? Centimeter cubes and cubic centimeters: Students may be confused at first about the difference between centimeter cubes and cubic centimeters. 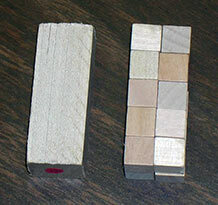 Centimeter cubes are the physical cubes, often made from wood or plastic; they have a dimension of one centimeter along each edge. A cubic centimeter is the amount of space that a centimeter cube takes up; it is a standard measure for volume. Distribute the sets of centimeter cubes to each group. Have the students work together to find a way to use the cubes to determine the correct volume order of the wooden blocks. By building a replica of Block Busing centimeter cubes, students can see that the volume of the block is 20 cubic centimeters. 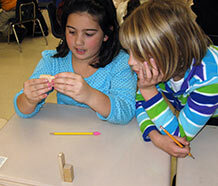 There may be stops and starts as students reveal their misconceptions about how to measure volume. For example, they may try to measure length and width, or they may surround the perimeter of a block with the centimeter cubes. Measure: The most successful strategy is to use the cubes to replicate a block, and then count the cubes to determine the volume. If one group discovers this strategy, they can share it with the class. 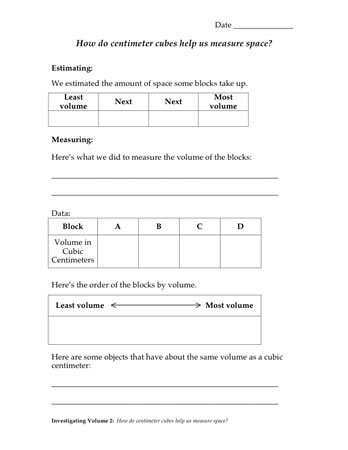 Make sure each student in a group measures the volume of at least one block, using the replication strategy. Then have the group establish the volume order of the blocks based on these measurements. After everyone has recorded the measured order their notebook, ask one student to enter the “Measured Order” in the bottom row of the class table. Make sure the entry includes the unit of measure: cubic centimeters. Does everyone agree on the measured volumes? How do the measurements compare to the “guesstimates”? Do students see how the opportunity to measure volume allows them to order the blocks even when the differences are very small? Finally, ask students to add one set of the blocks to the volume order line.